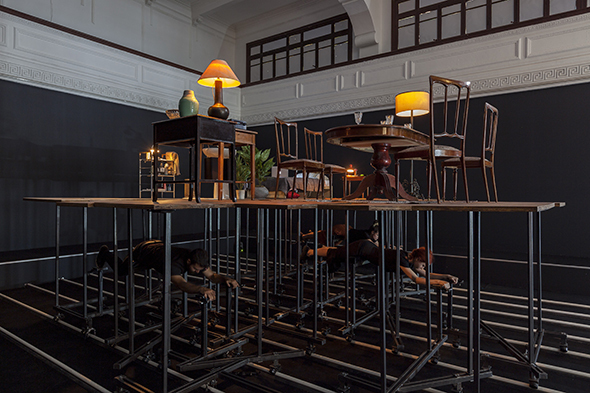 View of Pedro Gómez-Egaña, Domain of Things, Istanbul Biennial 2017. Installation, performance. Photo: Sahir Uğur Eren. Zilberman Gallery (Istanbul, Berlin) proudly announces the representation of Pedro Gómez-Egaña. Pedro Gómez-Egaña (1976, Colombia) lives and works in Bergen (Norway), and Copenhagen (Denmark). He studied music composition, performance, and visual arts at Goldsmiths College, Bergen National Academy of Arts, and completed his doctoral project with the Norwegian Research Fellowship Programme. Gómez-Egaña’s works have been presented at 15th Istanbul Biennial (Istanbul, Turkey, 2017), Contour Biennial (Mechelen, Belgium, 2017), Museo de Arte Moderno (Medellin, Colombia, 2017), Kochi-Muziris Biennial (Kochi, India, 2016), Mana Contemporary (New Jersey, USA, 2015), Colomboscope Biennial (Colombo, Sri Lanka, 2015), Performa 13 (New York, USA, 2013), Kunsthall Mulhouse (Mulhouse, France, 2013), Marrakech Biennial (Marrakech, Morocco, 2009), and Brussels Biennial (Brussels, Belgium, 2008). His recent solo shows took place at Entrée Bergen (Bergen, Norway, 2017), Hordaland Art Centre (Bergen, Norway, 2015), and Casas Riegner Bogotá (Bogotá, Colombia, 2013). Pedro Gómez-Egaña makes sculptures, immersive installations, phonographic pieces and films, also making use of different mediums such as performance, text and sound works. Central to his artistic approach is the performative aspect of sculpture, which he presents as dynamic, animated objects or as theatrical environments. His practice is motivated by technology and how it influences the ways in which we experience and understand time. His recent projects reconstruct and refer to historical examples of industrialization, presenting them as haunted and vulnerable. Drawing from both contemporary and historical intersections between science and the occult, Gómez-Egaña’s work also explores the relationship between technology and mysticism, and the emotional and spiritual undertones of digital culture.